Noticeable belches of alcohol drenched truths are brought to the forefront with a beer-belly that’s as fat as the notion that everything used to be better. 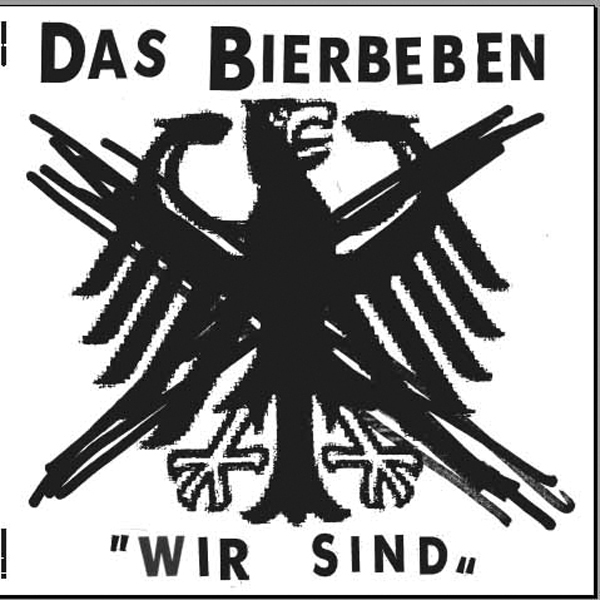 Das Bierbeben will destroy clubs. It was only last year when these recess rockers from Hamburg’s schoolyards recorded their debut „Die Birne ist reif“ on a tape deck in a rock-o-tronic wreck room with egg costumes and scorched rugs. These alcoholics from 2000 Hamburg/W.Germany decided that it’s too hard to drink with an instrument in your hand. So instead they diverted into digital desktop production with a Karlsquell spring water in one and a mouse in the other. It’s clear that Shitkatapult has snagged three songs for a 12“ release which will almost immediately earn the respect of the directionless masses, late-punks, and post-ravers. Here we go with the funky aerobics for released reservists of the highest rank who fuse bodily conditioning with mental fixation. This happens before any visit is possible to the Portugese street cafes of your given breakfast hood. „Wir sind und wir bleiben die Unreparierten“ merges two girls‘ silver voices with the unparticipatory tone of an automated subway intercom to the point where all waiting passengers are dancing in synch with the chorus line. „Sturm brich los“ comes as an electro-shock and whoever dared go near the EBM-niche of the early 90s will hear alarm bells ringing.